Last week, the Secret Victorianist, along with some student friends, attended MetStudents’ #LuciaMadness event before a production of Donizetti’s Lucia di Lammermoor at the Metropolitan Opera. Mary Zimmerman’s production has a mid-nineteenth-century setting, although Donizetti’s opera premiered in 1835, and Walter Scott’s The Bride of Lammermoor (the historical novel on which Salvadore Cammarano’s libretto was based) was published in 1819 and set in the seventeenth century. Mara Blumenfeld’s sumptuous costumes are instrumental in suggesting this period in the production (with Daniel Ostling’s striking sets more focussed on creating a Romantic Scottish landscape), so it was apt for the drinks event to encourage young operagoers to don Victorian dress of their own. There was even the opportunity to pose in Lucia’s blood-drenched gloves and veil and brandish her knife (check out #LuciaMadness on Twitter for more photos). 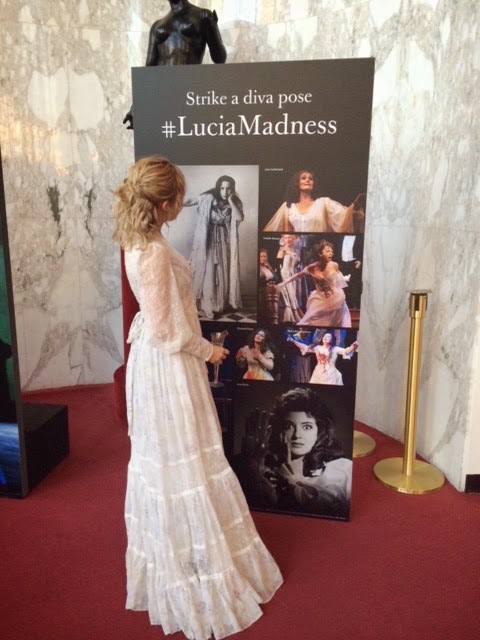 The emphasis on Lucia’s madness isn’t just a marketing ploy. The plot (familial feuds, love, betrayal) and the music move towards the climatic scene where Albina Shagimuratova’s blood-splattered bride loses her mind and hits the high notes in the beautiful aria ‘Il Dolce Suono’. That Lucia’s madness is especially important to this production in particular is suggested from Act One, where Zimmerman chooses to stage the ghost during Lucia’s ‘Regnava Nel Silenzio’. Madness seems the natural result of a young girl living out her life on these misty moors, surrounded by ghosts, and torn between the passions of her brother and lover. Joseph Calleja sang Edgardo with strength and passion, producing a second climactic moment after Lucia’s mad scene, but the scenes between the siblings (Shagimuratova with Luca Salsi’s Enrico) perhaps showed more connection between the performers. Other highlights included the injection of humour during the wedding scene. The cast pose for photographs as Lucia turns away from her groom and the camera, raising some titters from the audience just prior to the tragic and murderous turn of events. Lucia di Lammermoor is an opera with a timeless plot of love and betrayal, but a nineteenth-century setting seemed an ideal one, given how Victorianism can at times be a sort of shorthand in popular culture for the repression of women in marriage and their resulting madness. The production is running until April 10th so catch it if you can. Do you know of any other nineteenth-century-based plays or productions the Secret Victorianist should attend in New York? Let me know – here, on Facebook, on Google+, or by tweeting @SVictorianist! The other week, the Secret Victorianist left behind the cold of New York to visit the West Coast of the US for the first time. Although much of my visit was spent basking in the sun in Santa Monica and Malibu, there was still time to soak up some nineteenth-century culture and, ironically, to learn about a group of artists who immortalised the landscape here in the East. 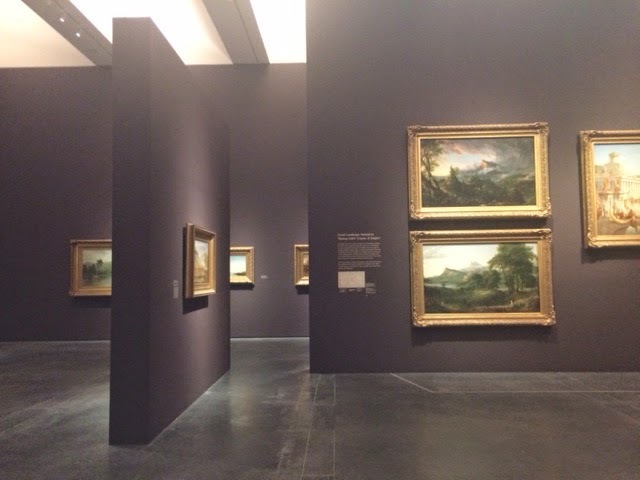 A special exhibition at LACMA - “Nature and the American Vision: The Hudson River School” - displays forty five landscape paintings from the New-York Historical Society collection by renowned nineteenth-century artists including Thomas Cole, Asher B. Durand, and Albert Bierstadt. 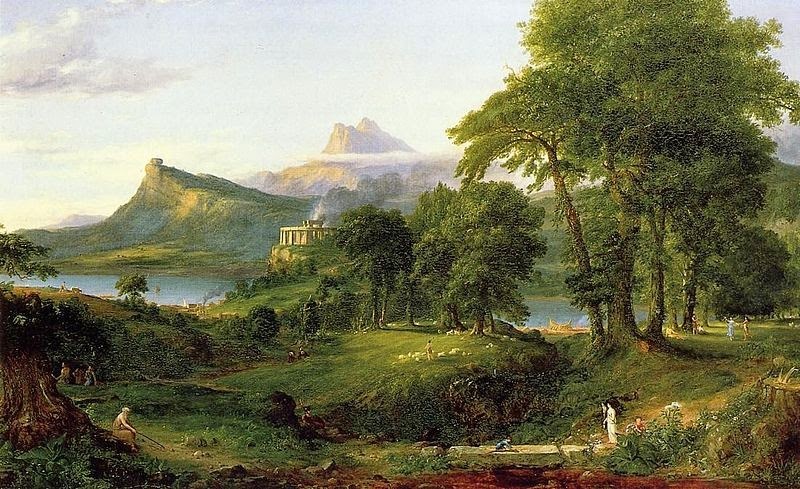 The paintings are beautiful representations of an unspoiled and idealised American landscape and give a wonderful insight into the American Grand Tour, which unlike its European equivalent, focussed on natural, not manmade wonders. 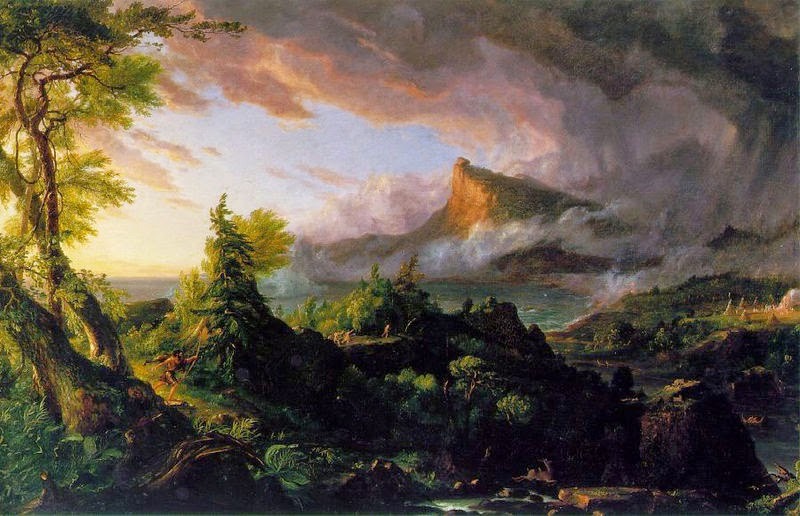 It as an artistic movement grappling with how to best create a national identity – borrowing from the landscapes which appear in Italian art and from Romantic styles of composition, while at the same time highlighting America’s difference, its vastness, its beauty, and the continuance of its Native peoples. This last concern can seem a bit uncomfortable when viewing the exhibition. In a collection largely devoid of human subjects, the inclusion of Native Americans in the occasional examples of portraiture can feel colonial and is a forcible reminder of how much has changed in terms of how this country is populated, as well as in how the landscape surrounding New York has changed. 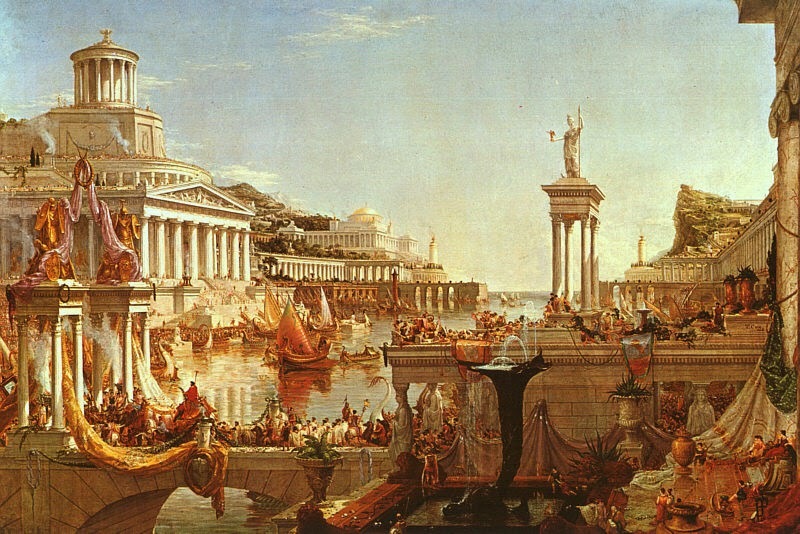 The centrepiece of the exhibition is a wonderful series of five paintings by Thomas Cole entitled The Course of Empire (1834-6), which offers an insight into another concern which has been a preoccupation in American culture, from nineteenth-century art and literature up until late twentieth-century and contemporary apocalyptic disaster movies. Cole’s paintings trace the patterns of rise and fall in civilisations – savagery giving way to an Arcadian pastoral existence, followed by the consummation of empire, its violent destruction and finally the desolation which follows. 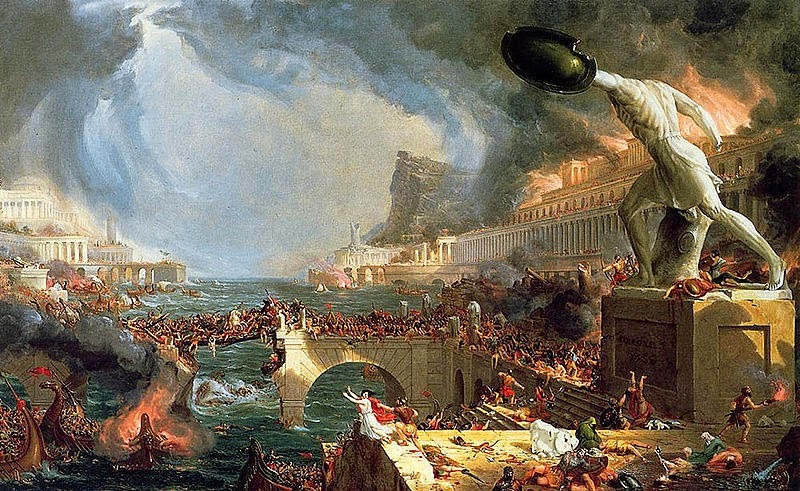 That America’s ascendency can – like other great empires - only end with a violent overthrow is a powerful idea and the series also suggests doubt as to whether romanticising America in the way this art movement does is not in some ways a contributory factor towards its eventual decline. The self-consciousness with which Cole raises this concern in these paintings is also in some ways reminiscent of Victorian approaches to literary epics (which I’ve dealt with previously). 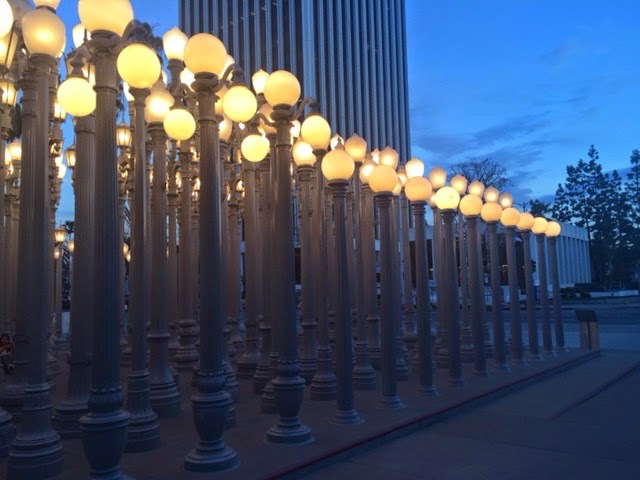 The exhibition is running at LACMA until June 7th with tickets priced at $25. If you’re in LA it’s well worth a visit (even if it’s not a rainy day). Do you know of any art exhibitions dealing with the nineteenth century the Secret Victorianist should visit in New York? Let me know – here, on Facebook, on Google+, or by tweeting @SVictorianist! 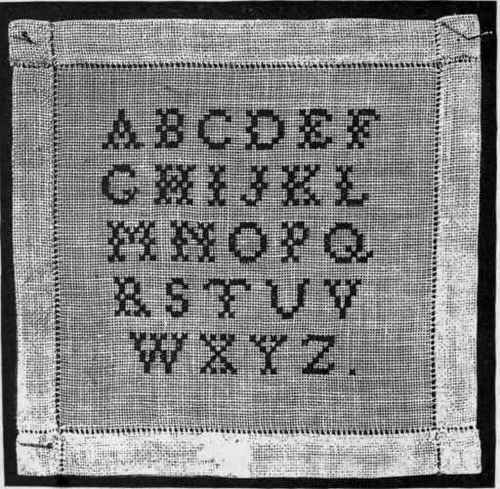 Eighteen months ago, I began a series looking at twenty-six themes and topics in Victorian literature linked to the letters of the alphabet. Now, having recently posted Z (for Zuleika! ), I’ll be recapping what we covered and linking to any posts you might have missed. In ‘A is for Animals in Agnes Grey’, I look at how cruelty or kindness to animals is often indicative of moral fibre in the works of Emily and Anne Brontë. The fate of animals in literature can often foreshadow or mirror the lives of characters, but can also provide some of the most memorable incidents in a plot, making this theme a powerful tool for philosophical and moral exploration. In ‘B is for Brownies in the Brain’, I examine Robert Louis Stevenson’s conception of the creative process in his essay ‘A Chapter on Dreams’. Where does literary inspiration come from and what forces could be at work in a writer’s subconscious? In ‘C is for Caroline’s Coriolanus’, I review the use of Shakespeare in Charlotte Brontë’s Shirley and in the relationship between two of her characters (Robert and Caroline). Brontë argues for literature as a vehicle for emotional, as well as academic, education. In ‘D is for Defending Daniel Deronda’, I argue for the complimentary nature of the Jewish and romantic ‘halves’ of George Eliot’s most divisive novel. Gwendolen and Daniel are united in their quest to find a vocation, whether religious or secular. In ‘E is for the Eloi and Elysium’, I trace the heritage of nineteenth-century science fiction, and in particular H.G. Wells, in a modern flick starring Matt Damon. How does Victorian thinking on class, economics and evolution inform modern cinema? In ‘F is for Fern Fever’, I write about the strange Victorian phenomenon of ‘pteridomania’ through the lens of Mary Elizabeth Braddon’s novel Vixen. How do hot houses relate to social status and what can women’s gardening habits tell us about them? In ‘G is for Graves in Great Expectations’, I look at the graves which inspired those of Pip’s parents and siblings in Charles Dickens’s most popular novel. The graves also act as signs for the illiterate Pip to ‘read’, signifying the dangers of partial knowledge as well as the virtues of ignorance - important ideas in a bildungsroman. In ‘H is for Hardy’s Hair Extensions’, I expose the link between hair and attractive femininity in Thomas Hardy’s The Woodlanders. What does it mean to take another woman’s hair? And how do Victorian ideas of ageing compare with our own? In ‘I is for Infants, Industrialisation and Imagination’, Victorian novels dealing with factory workers are put under the microscope. What does it mean to infantilise the working classes and why does Dickens choose to deal with the position of workers and the education of children in the same novel (Hard Times)? In ‘J is for Jealousy in Jewsbury’, I consider how stereotypes about actresses and wives are difficult to reconcile for male characters, but also the author, in Geraldine Jewsbury’s The Half-Sisters. In ‘K is for ‘The Kraken’’, I provide a line-by-line reading of Tennyson’s poem about a fearsome sea monster, helping students approach new poems and dig into this poem in particular. In ‘L is for Laura’s Landscapes’, I probe the gendered differences between landscape painting and portraiture in the most famous Victorian sensation novels. How comfortable can we be as modern readers with a conclusion to The Woman in White which leaves Laura still deluded about her role as artist as well as object? 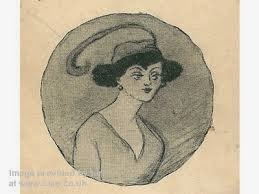 In ‘M is for Melodrama, Murder and Maria Marten’, I blog about a real life murder case which inspired a swathe of nineteenth- and twentieth-century creative treatments. Why did Maria Marten capture the imagination of Victorian audiences? In ‘N is for Nelly as Narrator’, I argue for the unreliability of Nelly as a source of information in Emily Brontë’s Wuthering Heights. In ‘O is for Openings’, I dissect the openings of Lady Audley’s Secret and The Woman in White. What can we learn from Braddon and Collins about creating suspense and drama? And how can writing thrill us in ways movies cannot? In ‘P is for Pregnancy’, I reveal the ‘hidden signs’ a female character you’re reading about may be pregnant. Tuning into Victorian innuendos and pregnancy ‘symptoms’ could help improve your reading experience. In ‘Q is for Quiz!’, you get to find our which Victorian heroine YOU should be. 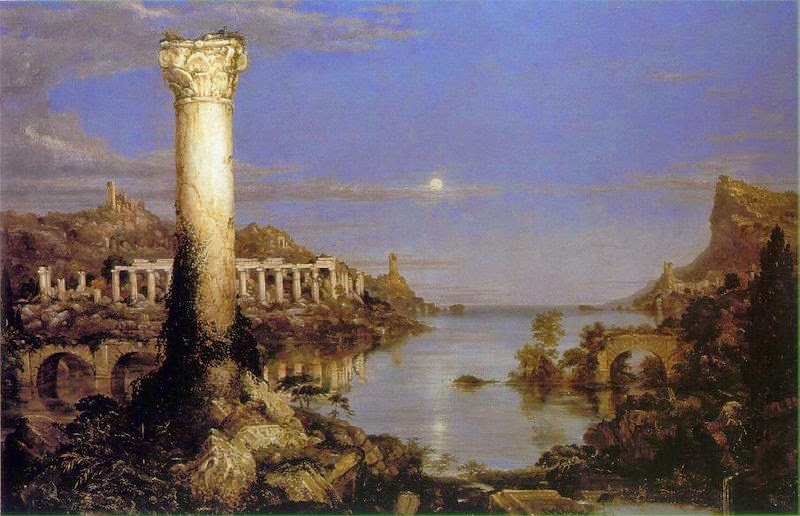 In ‘R is for Rome’, my trip to the Italian capital spurs a reconsideration of Dorothea’s trip there in George Eliot’s Middlemarch. Dorothea’s sheltered upbringing, Protestantism, and recent marriage all impact on her response to the city and so the chapters here offer valuable insight into her character. In ‘S is for Swinburne, Sappho and Sadomasochism’, I write about Swinburne’s adaptation of Sapphic fragments in nineteenth-century verse. What is the appeal of Sappho? Is it sexual, sadistic, or poetic? In ‘T is for Text, Time (and Trains)’, I blog about the skillful way in which Thomas Hardy’s narrative techniques play with the passing of time. Moving from Victorian novels to romantic comedies and horror flicks, I offer my perspective on the manipulation of time in text. In ‘U is for ‘Ulysses’ and You’, I remind you of the poetry scene in the latest James Bond movie and give a case for the continued appeal of Tennyson’s poem ‘Ulysses’. In ‘V is for Vulnerable Victorian Virginity’, Elizabeth Gaskell’s Ruth acts as an example of how female virginity is often presented in nineteenth-century literature. In ‘W is for Witchcraft’, I write about Hardy and Gaskell’s interest in magic and the supernatural. Witchcraft which we might think of as confined to earlier centuries is still very much alive in nineteenth-century rural England and in Victorian literature. In ‘X is for Xmas’, I analyse the poem (and later carol) ‘Christmas Bells’ by Henry Wadsworth Longfellow. Which ideas about the Christmas period span the centuries and what was unique about celebrating the festival during the American Civil War. In ‘Y is for Why Yellow?’, I answer the question about why this one colour was so important to writers in the 1890s. From fashionable magazines to madness-inducing wallpaper, why does yellow define the decade? And finally, in ‘Z is for Zuleika’, Max Beerbohm’s letters offer an insight into the creative process which went into writing his novel – Zuleika Dobson. Thank you so much to those who have stuck with me throughout the series and for all your comments and suggestions! I’m delighted to let you know I’ll be starting a new series in the next weeks, reviewing works of Neo-Victorian literature, so if you have any favourite works which fall into this category then let me know – here, on Facebook, on Google+, or by tweeting @SVictorianist! After 25 letters in my Victorian Alphabet, I’m cheating a little bit here, as Max Beerbohm’s Zuleika Dobson, or An Oxford Love Story wasn’t actually published until 1911. But, having recently finished reading Rupert Hart-Davis’s Letters Of Max Beerbohm, 1892-1956 , and seen how Zuleika, as a character and a novel, is such a strong presence in Max’s life long before the text’s publication (he began writing it in 1898), I feel justified in using her to round off this very Victorian series. “I could no more marry a man about whom I could not make a fool of myself than I could marry one who made a fool of himself about me. Else had I long ceased to be a spinster”. While the novel moves away from Zuleika at times – whether to the history of Oxford’s most elite drinking society, to the birds which are harbingers of death for holders of a particular dukedom, or to the muse of history Clio – she dominates the novel, and also seems to have dominated its creation. In his letters, Max even uses the word ‘Zuleika-ing’ to denote the act of writing and, in 1904, not only does he seem to have a very clear idea of the eventual plot, but he’s also personifying his work, talking about his inability to write a ‘skeleton’ of the rest of the novel, without it becoming a ‘full-fleshed figure’. ‘My dear Bobbie, Poor old Zuleika! She is at length to be dragged out, blinking and staggering, into the light of day. And Heinemann [his publisher] will be sending her to the Reform Club, to wait for you there. Be kind, be courteous, to the hag. Incline your ear to her mumblings. Pretend not to hear the horrid creakings of her joints. Tell her she does not look a day older than when you saw her or at any rate her head and shoulders all those years ago. Don’t hint to her that she makes a goblin of the sun. Yours affectionately, Max’. Here we see Beerbohm referencing the long gestation period his novel has been through. And we also see him using an identification between Zuleika the woman and Zuleika the novel to reference the faults in his writing (mere ‘mumblings’ with ‘creaking…joints’), while simultaneously pleading for kind critical judgement on them (without seeming to plead for himself). Max’s easy and familiar references to ‘Zuleika’ in his letters demonstrate beautifully the strong connection between artist and work (even an artist as humorous and, at times, flippant as Beerbohm). They also show the fascination ‘she’ as a character and as a project held over Max across several decades. Zuleika’s appeal may have decimated Oxford, but it has cemented Beerbohm’s place in literary history. This is the last in my Victorian Alphabet series, so let me know if you have any new series ideas – here, on Facebook, on Google+ or by tweeting @SVictorianist. And, if you want to find out more about Beerbohm’s Oxford, then click here for my top tourist tips for Victorianists who find themselves in England’s best city!